Paul Duff started playing in 1979. Soon after that he walked into a hotel in Fremantle Western Australia and discovered a bluegrass band playing. That band included Ian Simpson. Paul left the hotel determined to learn to play that music. Today, Paul cites Bill Monroe as been the overriding influence on his music but in the early days he was very intrigued with Sam Bush and David Grisman. However Paul has spent some time learning and playing with Mike Compton who has had a marked impact upon his own playing. Compton has taken Monroe’s style and developed it even further to the point where it is markedly different. 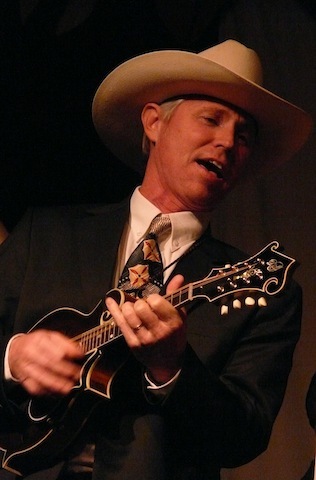 started the West Australian bluegrass band Bluegrass Parkway with his wife Maria (a native of Lexington Kentucky) in 1987 when he returned to Australia after living in the US. Paul named the band after the famous parkway that runs from Lexington down to I65. It was a toll road in those days, and Paul had spent so much time on it traveling to and from Nashville to watch bluegrass bands that he figured it owed him something. So he took the name for his band. Incidently, Bluegrass Parkway will celebrate its 25th anniversary in January 2012, and has toured widely throughout Australia, New Zealand and the US. Paul’s first band was made up of high school friends and called The Bandicoots. They started to perform around Perth and Fremantle in 1979. From those beginnings he formed a band known as Groundspeed. In 1984 Paul left Perth to reside and work in the US in 1984. He made a decision to live in the states to learn more about mandolin building and to see more bluegrass music. This move would have him living in the states for close to 2 years. 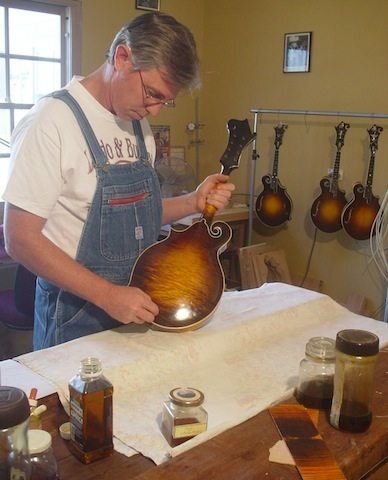 In 1985, after a few months of working at Flatiron Mandolins in Bozeman, Montana, Paul returned to Lexington, Kentucky, and met Maria. Within a week they were performing together in a local bluegrass band. The pair returned to Australia in 1986 to stay. Paul’s passion for building mandolins was born out of a chance encounter with the music that was to become such an important part of his life. The chances of walking into a venue and witnessing a bluegrass band perform in Western Australia, pretty much the opposite side of the planet to Kentucky, are reasonably remote. However, this is just what happened and it turned out to be a cathartic experience for Paul. Following that single encounter with bluegrass, he knew he had to learn to play the music and his focus was immediately drawn to the mandolin and fiddle. After hunting out a cheap fiddle and trying to find a teacher, his attention then turned to the mandolin. Is was soon evident that he had to find a better sounding mandolin than the cheap one he had initially bought, and this search is what led Paul into the world of Luthierie. After bui lding his first mandolin in 1982, Paul became fascinated with the array and diversity of skills, many of which are from a bygone era, that were required to successfully build a mandolin. In the almost three decades since, he has been focused on refining, developing and applying these skills to his one true passion; the mandolin family of instruments produced by Gibson in the 1920s. Perhaps another thirty years at the bench and I’ll be well on the way to getting my head around it – Paul Duff. Paul’s love of bluegrass music drew him automatically to the F5 mandolin of Bill Monroe, both musically and from a luthier’s perspective. 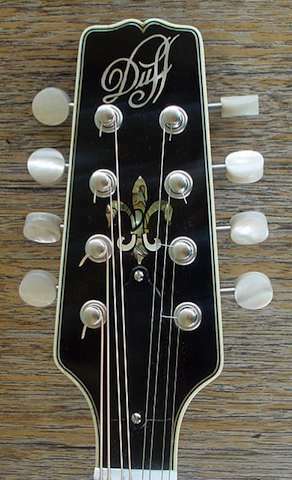 The first mandolin he ever built was an F5 model just like Monroe’s, a difficult undertaking as any builder will tell you. His attention has since broadened to other instruments from this Golden Era, also known as the Loar Period. Paul now includes mandolas, mandocellos and archtop guitars in his inventory of models offered to customers. The inspiration derived from the truly successful, spectacular instruments of this Loar Period is what drives Paul to spend each day ‘at the bench’. He is a hands-on kind of builder. He doesn’t use a CNC carving machine but does have a hand operated pantograph router. This allows him to save himself for the important hand carving of the top and back plate. Paul would rather master the art of the various skill sets rather than out source them. Consequently, his instruments are adorned with hand cut pearl and abalone inlays, coloured sunbursts are applied by hand and of course, they are french polished. Paul believes the development of the eye and ear are crucial to honing his skills. It takes years to gain an understanding of how you feel the instrument should look and sound. ABB: Who is your favourite Australian Old Timey or Bluegrass musician and why? My favourite Australian bluegrass musician would have to be Donal Baylor. This is not because he happens to be in our band either. Donal has such a devotion to making sure his playing faithfully represents the required feel or style of a particular piece we might be performing. If we need Kenny Baker in there, Donal’s got it covered in spades! If you need a bit of Paul Warren; he’s there too. I admire the obvious dedication and discipline Donal puts into researching his favourite fiddlers. His playing speaks for itself. What does the future hold for Paul Duff? I intend to keep Bluegrass Parkway’s performance schedule busy and stay very active in the Australian bluegrass scene. We all love performing in the band and it gives a great deal of enjoyment. We love working up new material and we’re exploring new aspects of the music all the time. As far as my mandolin building goes, I’m very dedicated to continuing to develop my skills. I want to work more with Compton to further increase my profile in the US. I will also start to work more on developing those markets outside of the US, especially Europe. What is your favourite performance arena, Concert, Recording or Jamming or other. Can you provide some explanation? I’ve always much preferred the concert arena to anything else. Bluegrass Parkway’s act is really founded on that old style, intimate concert situation. In many ways it works best in the same smaller venues that Monroe and the Stanleys would have utilised. For us, the ability to talk to the audience and present a show offers the most rewarding musical experience. Where do see the future of Bluegrass / Old Time heading in Australia? Bluegrass and Old Time music are growing noticeably in Australia. When we first started touring around Australia there were only one or two dedicated Bluegrass/Old Time festivals. This number has definitely increased and there are many more venues out there now. I think it is a healthy future. We are always going to have concerns over whether there are enough young people playing etc but these things come and go. If people are exposed to the music in a positive way then they will return to it regularly. Do you have any advice to aspiring musicians? I think the most important thing aspiring musicians can do is to listen. Listen very carefully and often. If you find someone who inspires you then take the time to listen. Play as much as possible and play with other people. Do you have any advice for us in terms of the responsibilities experienced players might have in shaping, leading or inspiring newer players? I think it is very important for experienced players to take the time to respond to new players if they approach you with questions or asking for advice. We have to be free and, most importantly, honest with our advice. Being available to offer workshops is a great opportunity to help and is always a valuable experience for newer players.